The deadline to submit articles for the newsletter is the 18th of the month. If you have questions about the newsletter, please contact communications specialist Debby Lovell. 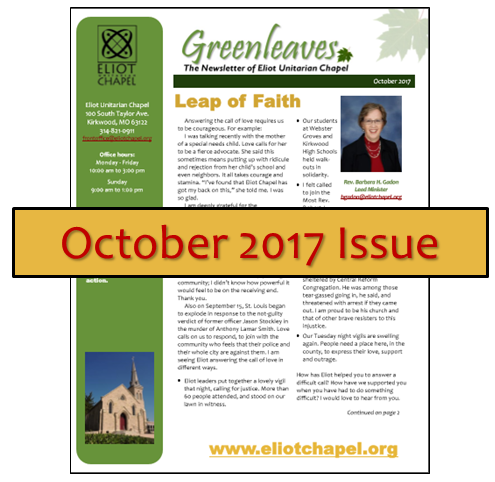 Greenleaves, the Eliot Chapel newsletter is published once a month, September through May. A link to the newsletter page on the website is emailed to our communications list each month when the newsletter is updated. A limited number of printed copies is mailed to those who do not have computer access or those who request a printed copy. If you would like to subscribe to the newsletter, please complete the form below for an electronic copy or email the church office to request a copy by mail. During the summer months when no newsletter is published, you can keep up with Eliot Chapel news by reading This Week at Eliot. To view other recent issues of the newsletter please click on the links below. 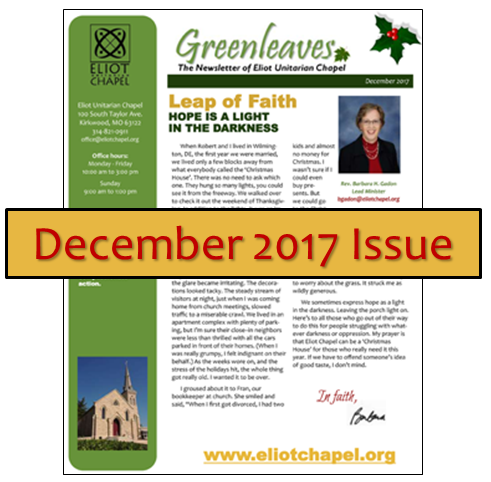 Click on the links below to view PDF copies of our recent Greenleaves issues.